Lewy Body Dementia (LBD) has extremely wide, gut-wrenching fluctuations. It is difficult to know if a drastic change is a Lewy spike, or a potential coffin spike. How can you know? Making the Decision to Go to ER. Is It The Right Place? Making the decision to go to a hospital emergency room (ER) is difficult, and frequently results from a worrisome change or crisis. Often, it is highly influenced by emotions. Using a baseline journal will help make a more objective decision, and will help with decisions when you are at the hospital. Before a Crisis Hits: Consider, Plan and Discuss. Consider the bigger picture. Think about the options and weigh the benefits of going to the ER. Consider the impact on your loved one: the potential for contracting another illness while there; how long it will take to be seen, assessed and treated; whether there is a possibility for worsening of the condition by being there; whether you can accompany them and how you will get back; and what your realistic expectations are of a cure. Discuss and plan for likely future scenarios with your loved one, if possible. Make it a priority. Understand the options and potential outcomes. For example, CPR success rates are only 15% for the general, healthy population. Resuscitating a frail, elderly person with chronic conditions can be close to zero, and CPR and related processes can be extremely intrusive and traumatic. What would your loved one want? What about feeding tubes? Would they want this type of intervention? Is duration of life more important than quality of life? What happens if resuscitation is successful, but the condition is profoundly worse than before? What would you wish for if you were in their shoes? If you think through those types of considerations, some of your decisions can be researched for your particular situation, and then pre-made, or at least pre-weighed. You will also have had the time to investigate options and get supports in place to make either choice workable. 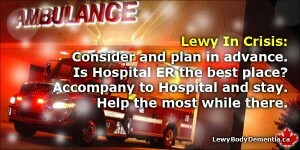 You will still have to make the final ER-trip decision, and this article provides two streams. One includes specific points to help make the decision. The second section explores what to do if you decide to go, what to take, what to do while your loved one is in the ER, and what to do afterwards — whether you are discharged or not. Do You REALLY Need to Go to The Hospital ER? First: Keep calm. Breathe. Your own agitation can magnify problem, make LO worse or less communicative. Weigh out the impacts vs. potential benefit of going. Avoiding the hospital can sometimes be the healthy choice. Lewy-speech and communication is often compromised – if symptom is being described, can you assess it yourself? Listen carefully, be open, dismiss your own preconceptions, reflect to your LO, reinterpret, repeat. Check for obvious possibilities first (UTI, infection, dehydration, respiration, constipation). Can you set up something with your General Practitioner to provide you with sample jars to make it simpler for you to bring in a specimen for testing, or get over-the-counter UTI tests? Have a list of key contact people with phone numbers that you can call to consult. Have this with you at all times (electronic or printed, both is best). Is there a house-call doctor option available? Telehealth? The cost may be worth it for the lowering of disruption and exposure to hospital environment. Could you try contacting a sympathetic or responsive specialist? A call or email to a doctor may help you avoid going to ER. Have plan, and have alternates: techniques to get off the floor if fallen, someone to call in emergency to help or check on the home. Instead of 911, there may be a local, non-emergency, number you can call to have firefighters come to get a person up from the floor. Join a legitimate online LBD Facebook group to get opinions if you are comfortable and confident with the medium. Some have vast experience and highly knowledgeable people around the world who may be able to provide perspective from personal experience of something identical. When You Have to Go to The ER. Bring your hospital kit with items for both of you: medications, phone AND charger, pen, paper, contact list, money, and clothes. Bring copies of baseline notes, any legal documents like Advanced Directives, PoA, DNR, etc, and medication list, allergies, list of dangerous medications for LBD (such as Haldol/haloperidol), etc. Stay with them in Emergency Room, and if they are admitted. Rigourously attend to hygiene: MRSI and C-Diff, etc., are potential killers, and can frequently be avoided. Apply even greater rigour for yourself. Disinfect, wear a mask, etc. Provide frequent close physical contact with your loved one to provide comfort, continuity and connection, reassure frequently, apologize and promise to do what you can to remedy (even if that is overly optimistic). If Trauma: advocate for sedatives and local anaesthetic. Avoid general anaesthetic. Pain medications: use Tylenol whenever possible rather than opiates. You may need to “translate” from questions asked by medical staff to a simpler version an LBD patient can comprehend. Listen for false statements, or Showtiming, where they say everything is fine, and help them provide details they may have forgotten or symptoms they have difficulty describing. Ask early if the situation could be managed as an out-patient: inform staff that risks and downsides increase the longer you stay. Try to prevent hospital-induced delirium as much as possible. Try to recognize the difference between their dementia, a typical Lewy behavioural fluctuation, and the onset of delirium. Ask for a quiet place, and try to keep LO and staff calm. Open or close door/drape depending on LO’s preference and reactions. Ask for alert-sounds from equipment in room to be silenced or quieter. This is usually done easily, but is rarely offered. Use “noise-cancelling” headphones and play something they like: they can be comfortable, will diminish the chaotic racket and be peaceful, if headphones tolerated. Bring something of interest to occupy your loved one. Quickly establish that they need to maintain medication schedule or a decline and difficult behaviours will likely emerge. Bring 24hrs of medications, pre-made in dosettes. Even if they will not allow your medications to be used (some will), the sooner you can administer them once discharged, the better (possibly as soon as you get out the door of the hospital). Advise them that persons with Lewy Bodies commonly have severe neuroleptic sensitivity. Avoid traditional anti-psychotics whenever possible. Request a paid-carer if you have to be away, depending on LO’s cognition. Some hospitals will have “sitters” that will be assigned without you having to pay for it (but they’ll never advise you of that, and they are frequently clueless about dealing with dementia and delerium). Always insist that someone help in the bathroom to prevent falls. If discharge is a potential, ask for details of what risk factors would be if you returned home. Carefully make notes, and ask for things to watch for once discharged. Carefully read the discharge instructions before you leave, digest the details, and ask questions while still at hospital with knowledgeable people available. Get them home as soon as viable – often will recover faster there. Don’t underestimate recovery times and relapse potential: almost always more difficult with LBD. No matter what decision you make, it will be the right decision if it is compassionately based on what you genuinely believe to be the best interests of your loved one. It is rarely an easy decision. Valuable stuff; Thank you, Mr. Hudson. I’ve been to hospital ERs (and then into various wards) with my Dad a number of times and it’s amazing how little awareness of the details of LBD medical people generally have. (Given that it’s perhaps 20% of dementia, you’d think they’d know not to give people Haldol, for instance.) But there are a few gems. We live and learn. Thanks for the note, Tai. You’re so right — it is stunning that there is so little awareness of what is such a common condition. And you’re right, there are some gems in the hospitals — I’ve encountered many: those who know already, and those who are willing to listen, learn and adapt. It’s not easy in those situations, but it makes a world of difference. Strength to you, and to your Dad. My LO is currently in the hospital by way of trauma ER. This article is spot on, and so helpful. Thanks! Glad it is of assistance. I always found the Emergency, ER, Trauma Centres and hospitals so utterly hard to manage for my own LO that over the many years, we noted a few things that could make a difference. Certainly asking to be poked and prodded less, get into a slightly quieter area, remove hearing aids (if used) or use very soft ear plugs to reduce the constant racket, beeping, screams, bangs and other crazy-making sounds made a big deal. If only there were ways to further reduce the delirium potential…..Strength to you, Karen! You are a superstar superhero carer! Thanks for info. My husband was admitted to hospital with the flu. Doctor gave him anti physcotic drugs without my consent . Was out of it for 3 days was not aware of this til sent to rehab. Set him back. Stay with patients if you can was not allowed to. Beware of the doctor. Sorry for what’s happened, Phyllis. The use of anti-psychotic medications seems a lot more common than is typically reported. Perhaps it’s because their effects are so often cataclysmic, and lead to precipitous declines. I can understand why they’re used, as a last resort with the good intention of helping a person in extreme distress or who is unmanageably disruptive or dangerous to others, but the outcome is too frequently catastrophic. > I hope he regains his abilities back to his previous baseline. This can be possible, but not in all cases. > Your vigilance and tenacity are making a huge difference, Phyllis, even if things are infinitely worse than you strive for. > Strength to you. Timothy Hudson.